Nordic Journal of Religion and Society is an arena for all disciplines that study the field of relations between religion, churches, religious institutions, culture and society. NJRS is the only Nordic journal devoted to these issues. Sociology of religion is a key discipline, but NJRS also includes contributions from scholars in psychology of religion, religious studies, church history and theology. The journal only publishes articles in English. NJRS is a referee journal. The journal is published by Universitetsforlaget (Scandinavian University Press) in cooperation with the Editorial committee, and with the support of Nordic Board for Periodicals in the Humanities and Social Sciences (NOP-HS)and KIFO Institute for Church, Religion and Worldview Research. This periodical is indexed in the ATLA Religion Database and EbscoHost. For more information about the journal (Aims and scope, Editorial, Guide to authors, Subscription and prices) and table of contents from 2006-, see Idunn.no. Send proofread manuscripts by e-mail (attachment) to one of the editors. See also «Notice to Contributors». Nordic Journal of Religion and Society seeks to publish original (not previously published) work of exceptional quality and interest in the area of religion and society. All manuscripts submitted to the Nordic Journal of Religion and Society should be sent as an attachment to the editors. The manuscript text should not be longer than 6000 words including footnotes, tables, figures and references. Only articles in English are accepted. The manuscript must be proofread and adapted to an English-speaking audience by a consultant whose native language is English. Use maximum three levels of headings, inclusive the title. Headings are not numbered. Author anonymity: In the paper, please omit name(s) of author(s) elsewhere, except when citing previous work. Self cites should always be done in the third person and in such a way that reviewers cannot identify author(s). Title page: Submit a separate title page with the following information: title, author(s) information (institution), date, number of words, and acknowledgements. Nordic Journal of Religion and Society seeks to publish book reviews for all disciplines that study the field of relations between religion, religious institutions, culture and society. The books reviewed either represent significant contributions to the field, or they analyze the role of religion in the Nordic countries, or they are authored by Nordic scholars. The journal only publishes book reviews in English. Provide, at the beginning of the review, the name of the author, year of publication, title (in italic), place of publication, publisher, and number of pages. For example: Schmidt, Garbi. 2004. Islam in Urban America. Sunni Muslims in Chicago. Philadelphia: Temple University Press. 256 pages. Include your name, academic title and institutional affiliation at the end of the review. Review length should be about 800-1200 words. If English is not your native language, please have your review proofread by a native English speaking person. Submit your review within six months unless otherwise agreed. NJRS uses the most recent edition of The Chicago Manual Style B (Author-Date System) for citation and referencing. Detailed referencing instructions are available here: http://www.chicagomanualofstyle.org/tools_citationguide.html. Identify all sources within the text, using the author-date system as described in The Chicago Manual of style. Citations in the text must agree exactly with the list of references. All sources that appear in the one place must appear in the other. References must include a Digital Object Identifier (DOI) for sources that have one. Place the DOI-URL at the end of the reference. To find out if a reference has a DOI, search by title or author at http://search.crossref.org/. URL is used for electronic sources without DOI. Only include the accessed date if the source is likely to change. Woodhead, Linda. 2011. “Five Concepts of Religion.” International Review of Sociology: Revue International de Sociologie 21(1): 121—43. http://dx.doi.org/10.1080/03906701.2011.544192. All figures and tables in the manuscript must be allowed published. If someone other than the author has made a figure or table, the name of the source should be stated in the text. The author is responsible for obtaining the permission to use earlier published illustrations. Placing of figures and tables in the text should be marked in the manuscript: [table / figure 1 about here]. Each table/figure should be numbered and editable in Microsoft Word. Title of table is placed above and title of figure below. Quotations of less than five lines are included in the sentence and marked by quotation marks (“). Quotations of five lines and more are written in 10 point and indented with no quotation marks. Notes in the manuscript should be organized as footnotes, when using regular text processing software. Notes should be kept to a minimum and used only for comment. The journal uses double blind reviewing of manuscripts. Manuscripts must therefore be anonymized by the author(s). Front side and information about the author(s) must be given in a separate document. All explicit self-references should be anonymized. 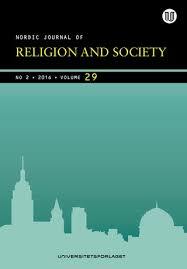 Copyright to articles published is held by Nordic Journal of Religion and Society. Nordic Journal of Religion and Society (NJRS) seeks to publish book reviews for all disciplines that study the field of relations between religion, religious institutions, culture and society. The books reviewed either represent significant contributions to the field, or they analyze the role of religion in the Nordic countries, or they are authored by Nordic scholars. The journal only publishes book reviews in English. Provide, at the beginning of the review, the name of the author, year of publication, title (in italic), place of publication, publisher, and number of pages. For example: Garbi Schmidt 2004. Islam in Urban America. Sunni Muslims in Chicago. Philadelphia: Temple University Press. 256 pages. Review length should be about 8-1200 words. 77-94 Hans Morten Haugen: Sweden Democrats’ appeal to Christianity : Can religious identity politicswin general support? 173-188 Marie Vejrup Nielsen and Lene Kühle: Relgion and state in Denmark: Exception among exceptions? 19-36 Ole Riis: Rejection of religious pluralism – the Danish case. 55-69 Phil Zuckerman: Why are Danes and Swedes so irreligious? side 113 Ulla Schmidt: A Weakened Link Between Religion and Morality? side 3 Thomas Luckmann: Livsverden: motebegrep eller forskningsprogram? side 13 Gustav Erik Gullikstad Karlsaune: «The Invisible Religion» A mossgrown milestone or a gate to the present? side 43 Kati Niemelä: Calling or vocation? side 53 Anne Birgitta Yeung: Why Volunteer? side 73 Ulla Schmidt: Hva har teologien å tilføre moralfilosofisk refleksjon? side 191 Arne Redse: Er buddhismen i Aust-Asia mahayana-buddhisme? side 205 Marie von der Lippe: En ny folkebevegelse i Latin-Amerika? side 55 Ingvill Plesner: Kan pluralitetens problem løses? side 68 Pål Repstad: Har du dekning for alt dette, Brunstad? side 106 Halvor Nordhaug: Nattverden i vår kirke – avsperring eller pådytting? side 160 Pål Repstad: Diakoniens integrasjon?